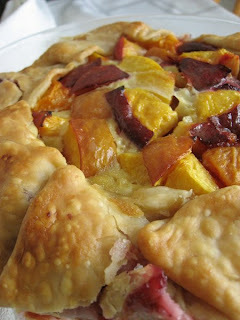 I enjoyed this galette much more than the cherry apple cobbler, and much more than I expected myself to. I honestly don't think I've ever had an apricot before, so this was a new flavor for me. Overall, I enjoyed it for what it was, but didn't love it. Chosen by Michelle from Michelle in Colorado Springs. Check out the other Tuesdays with Dorie bakers here. ****OK, I am an idiot and can't read... Bridget so kindly pointed out that Dorie says 8-9 pieces of fruit, total. oops! This was SUPER easy and delicious! I tried a bit before adding the salmon, as I don't like salmon. I thought it was great, even without, and my husband (who loves salmon) polished off the rest. I served it with sourdough bread (another favorite of his). I'm just going to come right out with it... I wasn't a fan. I'd take my Mixed Berry Cobbler back any day. I'm not sure if I'm just not a fan of cooked cherries, or the apple (oh, yeah, I subbed apple for rhubarb) and cherry combo wasn't doing it for me, or I obviously used too large a vessel for the amount of fruit, or what. I just wasn't diggin' it. So here is one picture of my ridiculous looking (can't wait to see the other cobblers and how bad I messed mine up!) mini Cherry Apple Cobbler. Chosen by Amanda from Like Sprinkles on a Cupcake. 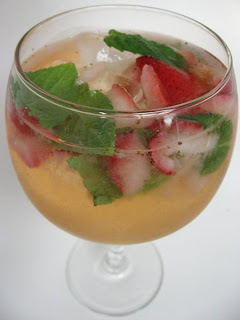 I was in the mood for a light, summer-y beverage that would use up some of the multitude of wine we have sitting around. I found this recipe in a sangria recipe book that I got as a gift, and thought it would be perfect since I also have an overbearingly large mint plant on my balcony. This summer drink definitely fit the bill for light, fruity, crisp with a little tang. Now, time to go relax! ~1/2 cup fresh mint leaves, approximately 20 leaves. When ready to serve, add the club soda and stir gently with a long-handled wooden spoon. 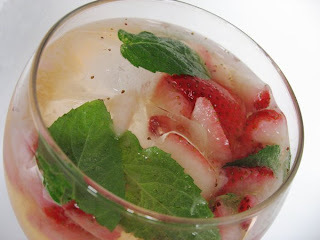 Fill highballs, wine glasses, or other decorative glasses with ice cubes and slowly pour the sangria over the ice, allowing strawberry slices to fall into the glasses. Garnish each glass with a mint sprig, if desired. These were too cute not to make! Typically, I am anti-making one type of food look like some other type of food, but this looked too fun. Someone on the What's Cooking board found them on the Martha Stewart website, and I decided I had to make them for a summer party. These were pretty easy to throw together, you could probably use any vanilla cupcake recipe you like (but I don't have a favorite so I made the one from the website). 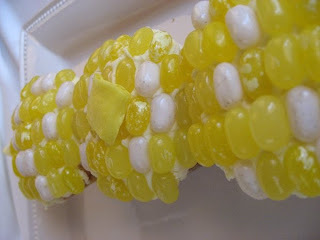 Just get some frosting, yellow and white jelly beans, a few yellow starburst, and you are on your way! They are fun to decorate and super cute. Preheat oven to 350 degrees. Line 2 standard 12-cup muffin tins with cupcake liners; set aside. Whisk together flour, baking powder, baking soda, and salt in a medium bowl; set aside. Combine milk, oil, and vanilla in a small bowl; set aside. In the bowl of an electric mixer fitted with the paddle attachment, beat butter and sugar until light and fluffy, about 3 minutes. Add eggs, one at a time, beating well after each addition. Reduce speed to low and add flour mixture, alternating with milk mixture, beginning and ending with the flour mixture; beat until well combined, scraping down sides of bowl as necessary. Fill muffin cups two-thirds full with batter. Transfer muffin tins to oven and bake until golden and a toothpick inserted into the center comes out clean, 15 to 20 minutes. Transfer cupcakes to a wire rack; let cool completely before decorating. Color the frosting pale yellow with food coloring. Working with 3 cupcakes at a time, frost cupcakes with yellow frosting. 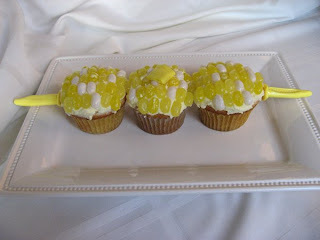 Arrange 5 rows of jelly beans, close together, on each cupcake. 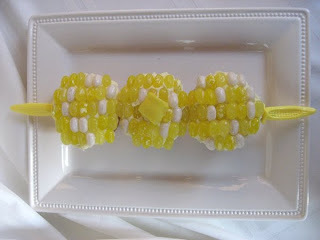 Place the 3 cupcakes side by side on a corn dish or serving platter to resemble an ear of corn. Repeat process with remaining cupcakes, frosting, and jelly beans. Cut the fruit chews into eight 1-inch squares. Soften the edges slightly by hand so that they look like melted butter. Place 1 square on top of each ear of corn. Sprinkle with sugars. Insert a corn holder in the end of each ear of corn, if using. Serve. Chosen by Melissa from Its Melissa's Kitchen. My brother sent me a Williams Sonoma gift card for my birthday a few weeks ago. I tucked it away and figured some day I'd have something I wanted to buy from there. That day came a little sooner than expected when I saw THIS baby, ON SALE. Here is my new beautiful blue Emile Henry faitout. I heart her! I was so excited to come home and introduce my husband to the newest member of our family, and have my very first Emile Henry piece. (Now, if they'd only put those pie plates on sale!) If you feel so inclined, help me name her! I really really enjoyed this cornbread. It was not only great when warm, with the cheddar nicely melted, but also at room temp. You have to love versatility! Since we finally had some cayenne peppers coming off our little pepper plant, I decided to use those instead of jalapeno. I can't wait to make this again! In 3½ to 4 quart slow cooker, combine bell pepper, onion and garlic. In medium bowl, combine corn meal, chili powder, oregano, cumin and salt; mix well. Add chicken; toss to coat. Add chicken and any remaining seasoning mixture to vegetables in slow cooker. Add picante sauce, beans and tomatoes; stir gently to mix. Cook on low setting for 6-8 hrs. For a spicier chili, use 3 tablespoons of chili powder. For a less spicy recipe, use mild picante sauce or salsa. To prepare sauce, combine first 6 ingredients, stirring with a whisk until smooth. Prepare grill. To prepare burgers, place onions and next 5 ingredients (onions through chicken) in a food processor; process until coarsely ground. Divide mixture into 4 equal portions, shaping each into a 1/2-inch-thick patty. Place patties on a grill rack coated with cooking spray; grill 4 minutes on each side or until done. Place rolls, cut sides down, on grill rack; grill 1 minute or until toasted. Place 1 patty on bottom half of each roll; top each serving with 1/4 cup sprouts, about 1 tablespoon sauce, and top half of roll. I don't think I've ever had blueberry pie before. I'm kinda of an Apple Pie girl, and to be honest, I wasn't even really interested in trying this. Oddly enough, my "I don't really like sweets" husband seemed VERY interested in it. So, I made a big pie to take to work, and a little mini pie just for him. :-) This pie definitely got rave reviews, so I snuck a small piece for myself. It certainly won't replace apple pie at the top of my list, but it sure was some great pie! Chosen by Amy of South in Your Mouth. In the next year, I hope to be more creative and present more original dishes (outside of the aforementioned Platinum Chef Challenge, which seems to be the only thing to get my wheels turning!). I also plan to work a lot more on cake decorating techniques, so watch for that! Of course, there will still be plenty of my favorites: Tuesdays with Dorie, Barefoot Bloggers, and Platinum Chef Challenge! 1. 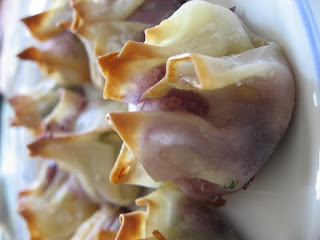 Sweet Mexican Wontons. I made these for Platinum Chef 2, and was darn impressed with myself. I have been searching for a reason to make them again... and I think I have found it, so I can't wait! 2. Banana Roll with Blueberry Lemon Cream Cheese Filling. This recipe came courtesy of Amber's Kitchen, and was the first one that I brought to work that got a recipe request. 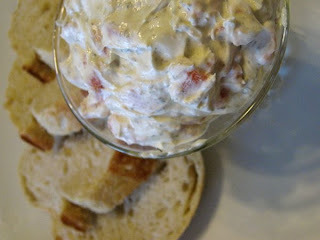 SO tasty and great for summer! 3. Spicy Garlicky Limey Chicken. This has been an absolute favorite in our house, another one courtesy of Amber's Kitchen. 4. Black Bean Burgers. Another product of the Platinum Chef Challenge was these burgers. We LOVE them and have them whenever we need a change from chicken. My husband loves the cheesy center! 6. Old Time Vanilla Ice Cream. I live for ice cream. (really). I had been trying a few hit or miss recipes, but when I stumbled on this gem, I never looked back. It was SO creamy and delicious, I almost couldn't believe it! Over time, I have tweaked the recipe to contain less heavy cream (trust me, my hips don't need it!) and it has held up beautifully. It's a very versatile recipe that is used as a base for many variations, which can be found on Doc's website (yes, the yellow hurts my eyes, too!). 7. Pumpkin and Goat Cheese Risotto Balls. *Love*! These were soooo good. Definitely a rare treat, for me. The warm risotto, creamy goat cheese, and cool mascarpone sauce worked together to make a beautiful dish. This is another recipe that I can't wait for another reason to make! 8. Warm Asian Noodle Salad. This was a dish that came highly recommended and seemed like something we'd like, so I gave it a shot. We love it SO much that I immediately made plans to make it again the following weekend. Great combination of flavors and I loved the fresh vegetables. Great dish! 9. Caramel Butterscotch Brownies. On the quest to perfect my husband's favorite dessert, I flipped through my new copy of Baking Illustrated and settled on a brownie recipe. Boy, was I glad I did! This took the brownies to a whole new level, and has floored everyone that has tried them. They are amazing! Since I seem to be the Queen of destroying all things biscuits and scones, I didn't have high hopes for this week's recipe, Apple Cheddar Scones (chosen by Karina of The Floured Apron). I am fairly certain I over mix/beat the batter, and end up with something resembling a hockey puck, only moderately better tasting. But, I am in this group to bake, so bake I did! I know better than to plan on being able to bring edible scones to work, so I cut the recipe down to make 3 scones. When I was getting ready to form them, I caught my mini muffin tin out of the corner of my eye... and voila! Mini muffin scones were born. These came out a little dry for me, probably over baked and without enough liquid in the batter. I didn't get much apple flavor from them, and think they'd be great taken in a different direction... jalapenos, perhaps? All considered, they were my best biscuit/scone attempt, yet... so maybe there is hope for the QODATBAS?